Iowa outscored Wisconsin 7-0 to end the game. 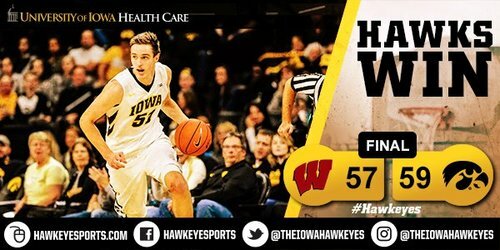 Iowa wins 59-57 to register its third straight win and fourth win over a ranked opponent. Wisconsin finished 5-for-14 from the free throw line. Ethan Happ 1-for-7 from the line. Might be worst #Badgers ' loss I've covered. UW melted down at the end. Poor execution. Poor choices. First version of #Badgers ' story filed. I will tweet link when I see it. Bench points: 24-4 edge for Iowa over #Badgers . Fran McCaffery on Jordan Bohannon: He consistently makes the kind of plays you see tonight. He never rattles. Free throws: Iowa 6-7 and #Badgers 5-14 for 35.7%. Iowa's McCaffery: The way we stayed together was critical. #Badgers led by 9 with 3:46 left and by five with 2:03 left. UW with 1 point in final 3:45. Gard: I can't fault the effort ... but we walk such a fine line and we have all year. Gard said the cuts coming to the inbounder were not done well enough, putting the inbounder in a bad situation. Gard: I think this group will bounce back ... When we do snap out of it, it will be a pretty callused group. Gard: I thought Jordan Hill was a huge spark plug for us. He gave us a boost when we needed it. Gard: They can't go back and change the foul call on Showalter, even if it wasn't. Zak Showalter and Nigel Hayes addressing the media from the players. Hayes: We're trying to crawl out of it ... We've got to stop shooting ourselves in the foot first. We've got to put together a full game.